There are many different causes of elbow pain including tendonitis (inflammation and injury to the tendons -- soft tissues that attach muscle to bone), bursitis, arthritis, strains and infection. Persons who play tennis and racquet ball sports are most likely to injure the tendons on the outside of the elbow. (tennis elbow) while golfers are most prone to tendon injury on the inside of the elbow. There are other frequent causes of elbow tendonitis including baseball, gardening, wrist overuse and screwdriver overuse. Typically, the symptoms evolve gradually. One of the main symptoms is pain and tenderness along the outside of the elbow and occasionally along the muscles on top of the forearm. Commonly, the pain and soreness may vanish after a day or so however if the activity that initially triggered the pain is repeated, the symptoms are likely to return. Left untreated elbow pain can become progressively worse leading to tendon damage. Sometimes tennis elbow pain can be constant and lead to sleep disturbance. Stiffness of the arm –especially in the morning, pain on turning door handles or shaking hands is also commonly a problem. 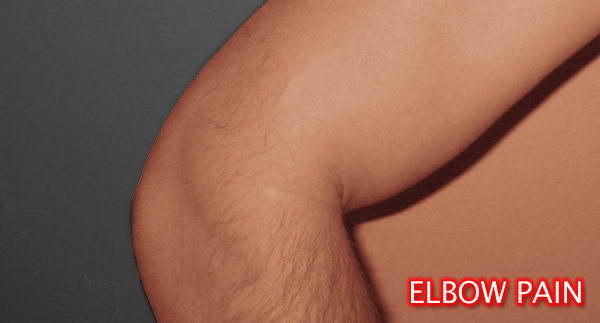 It is important to obtain a physician evaluation of all elbow pain conditions. While most elbow pain conditions improve on their own, there are conditions that can cause elbow pain which are lingering and incapacitating. Therefore a precise diagnosis is important. The physician clinical evaluation along with diagnostic tests such as x-ray and MRI are helpful. Recently, the availability of office based musculoskeltal ultrasound has greatly improved diagnosis and treatment options. Key advantages of this technique include cost-effectiveness, availability and ability to perform a dynamic examination (examination of the joint during movement).